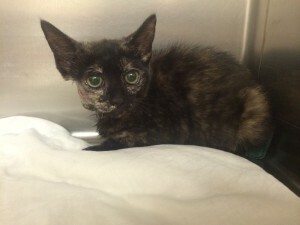 Just recently a 9 week old kitten (“Mia’s Kitten #2) was seen at Belle Mead Animal Hospital, Hillsborough, N.J., for a swollen area on the side of her face. This was presumed to be wound or abscess of some sort. Upon closer examination, it was discovered that this was a very unique type of problem. (VIDEO: Cuterebra identified in kitten’s face). It was determined that the “wound” on the side of the kitten’s face was actually a large opening or fistula. And the movement that was detected on exam (and as evident in the video) was actually a Cuterebra larva coming up for air! The area was very swollen and infected as well. 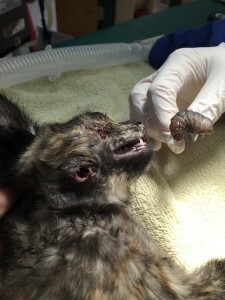 The kitten was given some pain medication and sedation. The Cuterebra was pulled out very carefully with gentle traction and forceps (VIDEO: Pulling Cuterebra parasite from kitten’s face). Afterwards, the area was cleaned thoroughly and the edges of the large defect left in the kitten’s face were debrided. This helps to insure that the wound can heal itself slowly without the risk of getting infected or forming an abscess. 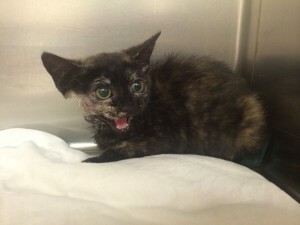 The kitten was given antibiotics, and she did wonderfully! You removed WHAT from my face??!!! Kitten doing GREAT after Cuterebra removed! Cuterebriasis is a condition that affects small mammals who spend time outdoors. We see this problem seasonally, during the warm months of July, August and September. A “Cuterebra” is a larva of the botfly. These flies lay eggs near animal burrows, i.e. rodent and rabbit burrows, in the northeast United States. Typically, the female botfly lays about 5-15 eggs per site. The eggs hatch because of a sudden rise in temperature and the moist larva attach to the fur of small mammals. The larva can be licked or swallowed during grooming or enter the small mammal through the mouth, nostrils or through a wound. Outdoor cats are particularly susceptible when they are sniffing or rummaging through rodent and rabbit burrows. This is why it is common to find Cuterebra on the face, chest and neck of cats. The preferred site for the larva is the subcutaneous tissue (tissue under the skin). Typically, 3-4 weeks after infection it becomes evident that there is an opening and swelling at the skin surface. The swelling (where the larva is incubating) is called a “warble” and the opening provides an area where the larva can breathe and excrete. (You can see this in the video above). During the time that the larva is migrating and/or incubating, it can cause a lot of tissue damage, inflammation and infection. Sometimes these lesions are also painful. Once the larva is ready, it will come out of the skin and fall to the ground to finish its maturation. It will pupate into an adult botfly and start the cycle all over again. There is also a more serious version of Cuterebriasis seen in the cat called Feline Ischemic Encephalopathy (FIE). This is when the larva actually crawls into the feline nares (nostrils) and migrates up through the cribriform plate and into the brain! Cats with this disease will develop neurologic signs (seizures, circling, behavior changes, ataxia, etc.) as the larva migrates through certain areas of the brain. Usually, these cats will have a history of have sneezing or nasal discharge one week prior to these neurologic signs. Cuterebriasis is typically very treatable. 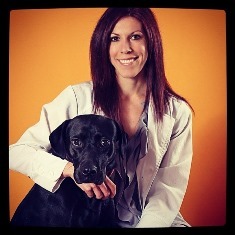 The subcutaneous form is easily identified by a veterinarian. Patients (typically cats) should be given pain medication and often need sedation. Care should be taken to remove the larva, because if the larva ruptures in the tissue or part of the larva is left in the warble, then a chronic inflammatory response or infection can ensue. It is even possible for a cat to have a severe anaphylactic reaction if the larva ruptures. Therefore, owners should not attempt to squeeze or pull them out on their own. After the larva is removed, the area is flushed and cleaned thoroughly. Sometimes the tissue edges need to be surgically debrided to encourage healing. Antibiotics are typically administered. The hole left by the larva is kept open to heal slowly on its own so as to avoid infection. The neurologic manifestation of Cuterebriasis is certainly more serious, but can be treatable. This is why it is important to have your pet seen right away if he is displaying any neurologic signs or abnormal behavior. This entry was posted in General Pets, Veterinary Medicine and tagged Felines, Kittens, Veterinary Medicine. Bookmark the permalink. ← Family fun at Bark in the Park Night!